We are a general contractor specializing in demolition and environmental projects. Company-wide support and experience allows us to perform a seamless transition from Environmental work (Asbestos Abatement, Lead Remediation, Mold Removal, Consultation and Testing) to Demolition (Dismantling, Decommissioning, Salvage, Recycling, and Asset Management).) Our clients include building owners, developers, contractors, health care providers, institutions, and manufacturing companies that are committed to providing and maintaining a safe and productive workplace, and residential owners concerned with safety. Demolition contrasts with deconstruction, which involves taking a building apart while carefully preserving valuable elements for re-use. For small buildings, such as houses, that are only two or three stories high, demolition is a rather simple process. 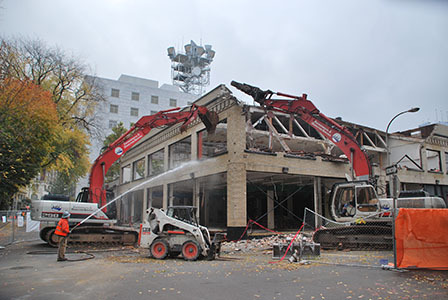 The building is pulled down either manually or mechanically using large hydraulic equipment: elevated work platforms, cranes, excavators or bulldozers. Larger buildings may require the use of a wrecking ball, a heavy weight on a cable that is swung by a crane into the side of the buildings. Wrecking balls are especially effective against masonry, but are less easily controlled and often less efficient than other methods. Newer methods may use rotational hydraulic shears and silenced rock-breakers attached to excavators to cut or break through wood, steel, and concrete. The use of shears is especially common when flame-cutting would be dangerous. The experience we provide will give you the best project management, innovative solutions, and up-to-date engineering technologies for your project. LOI Environmental and Demolition Services is a member of professional associations such as National Demolition Association. Quality and Safe demolition projects in Aluminum, Paper, and Chemical plants. We have an experienced and knowledgeable staff to create and engineer pre-task plans to perform difficult projects. Some of the most difficult projects involve removing buildings in downtown areas with high traffic, both pedestrian and automobile movement near the project. We have the experience to mitigate liabilities, whether they are environmental or safety-related. 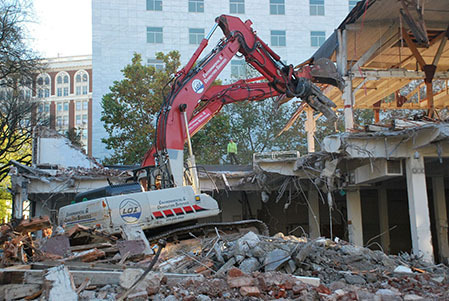 LOI Environmental & Demolition Services works closely with owners and general contractors in providing both stand alone TI Demolition and Abatement Services and combined hazardous materials abatement and TI demolition Services. Clients can approach TI projects confident that remediation and demolition services will be properly coordinated and not impede project scheduling and execution.